Known as the most popular state park in Michigan for its abundant natural resources and endless activities, the Ludington State Park offers a vacation within itself. Ludington has so much to offer its residents and visitors, but our most popular draw is the 5,300 acres that lie just north of town, known as the Ludington State Park. The park opened on August 15, 1936, and is celebrating its 80th birthday in 2016. This wonderful area of land is not just for camping--it's a haven for hikers, fishermen, bikers, or anyone who loves what nature has to offer. Here you'll discover sand dunes with spectacular views, hardwood forests, marshlands, and nearly seven miles of Lake Michigan shoreline. The state park is a vacation within itself, with special programs offered in the summer. For Camp Reservations, Call 1-800-447-2757, or go to www.michigan.gov/dnr. Campsites fill fast so call early in the season. A Michigan State Park Recreation Passport is required to enter the park and may be purchased at the park. Residents may also now purchase the $11 Recreation Passport when they renew their Michigan license plate at the Secretary of State office or through the Michigan e-store at www.michigan.gov/estore. Enjoy a hike on one of the eight marked trails that cover 18 miles, and take note of the variety of trail markers and information kiosks along the way which provide some fascinating historical and natural facts about the Ludington State Park. A description of the individual trails - and the estimated walking time for each - is detailed at the Trail Maps page in this website. From this page, you will be able to print a PDF of the trail map to carry along with you on your hike. The park is also well known for its unique and picturesque marked canoe pathway. Launch your canoe at the Hamlin Lake Beach and meander along the eastern shore of Hamlin Lake through shallow bayous rich with wildlife and waterfowl. The time required to travel the pathway is about one to three hours, depending upon your skill level and preferred pace. Canoes are available to rent from the Hamlin Lake Concession Stand, where you can also rent paddleboats, rowboats, and kayaks. After a busy day enjoying all the park's activities, head over to the Amphitheater on select nights at 7pm and take in a fun and enjoyable performance. Most are folk music, but some feature animals and even a magic show. Click here to see the 2016 schedule. 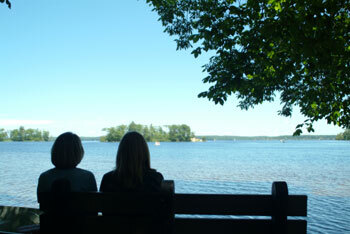 Families especially appreciate the park's Hamlin Lake Beach for its calm waters, sandy shore, playground, picnic shelter, restrooms, and concessions. From here, it's just a short stroll to the Hamlin Lake Dam, which was constructed during the logging era when lumbermen dammed the Big Sable River to make a holding pond for felled trees. The other beach stretches for miles along Lake Michigan, perfect for sunning, swimming, and jumping in the waves on a windy day! There is now an accessible walkway that starts at the Lake Michigan Beach House and ends near the shoreline. There are also three beach chairs that are available for the public's use. Don't forget to check out some of the nations best sand dunes right here in West Michigan. Ludington State Park has miles of dunes to explore, and if that isn't enough, more dunes are just a short drive in either direction. 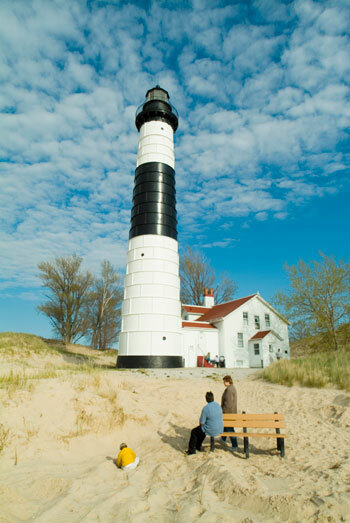 Within the Ludington State Park, you will find the Big Sable Point Lighthouse - a favorite hiking destination for visitors. The black-and-white striped, 112 foot lighthouse at the Ludington State Park stands proudly on the shores of Lake Michigan and remains a testament to lighthouse keepers of the past. Big Sable Point Lighthouse was honored as the 2013 Featured Lighthouse of the Year for the Great Lakes Lighthouse Festival. The Sable Points Lighthouse Keepers Association maintains the Big Sable Point Lighthouse, north of Ludington State Park. The lighthouse is open for tours daily 10am-5pm from May 1 to October 31. You can climb to the top, or visit the gift shop, located in the original Keeper's Quarters. The Canoe Trail, which begins at the Hamlin Beach, is a relaxing way to spend a few hours. The trail is four miles, but you can choose any length you want. It's perfect for both canoes and kayaks, both novice and experienced. 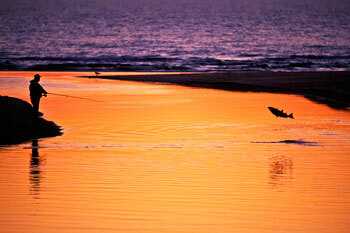 You'll glide through marshland and see a variety of wildlife. You can also paddle toward Lost Lake and pass boardwalks, foot bridges and small islands. 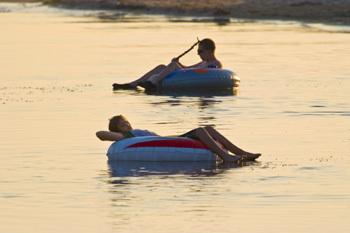 Another way to enjoy the water at the Ludington State Park is to tube down the Sable River. It's not a very fast-moving river, so it's another fun activity the entire family can enjoy. The Ludington State Park is a fisherman's paradise, where anglers will discover an abundance of Hamlin Lake walleye, bass, northern pike, perch, and bluegill. A boat launch provides easy access into the lake for boats up to 22 feet, with convenient parking for trailers. During the fall salmon run, when the fish attempt to jump over the dam on their way upstream, spectators and anglers line the Sable River Boardwalk to capture the thrill of this fishing season highlight. A hard surface walkway provides handicapped access across the dam and along both sides of the river. Other areas in the park that are barrier-free are the Hamlin Beach changing and concession building, certain campsites and all restroom buildings in the Pines, Cedar and middle Beechwood campgrounds. See www.LudingtonFishingReports.com for the latest fishing reports and other related fishing information. So many people are familiar with all that the park offers during summer, but in the quieter seasons of spring, fall and winter, the Ludington State Park's beauty is magnified by serenity. When winter blankets the landscape with a pristine white hush, snow lovers can cross country ski on eight miles of trails...three of which are groomed. Snowshoeing is another great winter activity that's growing in popularity and you can burn up to 700 calories per hour of moderate walking! 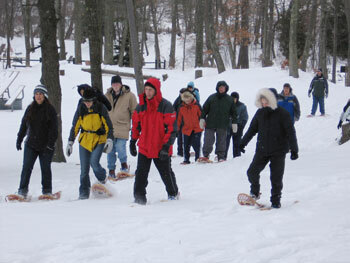 Guided snowshoe walks are held throughout the winter. You can bring your own snowshoes or borrow one of 40 pairs available on a first-come first-served basis at the state park. All walks begin and end at the warming shelter complete with picnic tables--and plenty of heat! The Ludington State Park also offers annual snowshoe making classes during November and December. Coming through downtown Ludington, follow Ludington Avenue to the end, and turn right onto N. Lakeshore Drive. Follow this until the fork in the road, and keep left onto M-116. This takes you along Lake Michigan and out to the State Park. Discover the beauty--experience the fun--at VisitLudingtonStatePark.com.